In cooperation with Elms College, the Irish Cultural Center is pleased to offer a range of Irish classes for the 2018/2019 academic year. In addition, this partnership is again successful in bringing to campus our ninth consecutive Irish Fulbright Foreign Language Teaching Assistant, Jill McMahon. 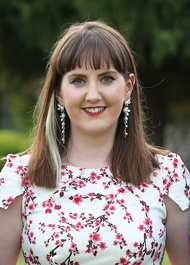 Jill has a first-class honours degree in Irish & Journalism from Dublin City University, and has worked solely in the Irish language sector for the past five years. Her work with organizations such as Conradh na Gaeilge and Gaeloideachas has seen her involved in Irish language education for the past few years, an area that is integral to the preservation, promotion and maintenance of the Irish language in Ireland. She currently works as Education Officer with Conradh na Gaeilge, offering a range of Irish language classes to adults in Dublin. Her main language promotion and teaching is through Irish national sports, as a volunteer with the Gaelic Athletics Association. Jill will teach the Intermediate: Advanced class this school year. To enroll for all classes, please download the registration form. Classes take place at Elms College. ICC Patrons receive a $50 discount. These classes are a continuation from the fall semester. This course is focused on all four language skills: reading, writing, speaking, and listening. Beginner class – no prior study needed! • Mondays 6:45 – 8:45 pm: January 28 – May 6, 2019. Taught by Gerald Costello. Cost is $150. For students who have had one year of prior study, and are not yet ready to enroll in the Intermediate class. • Tuesdays 6:45 – 8:45 pm: January 29 – May 7, 2019. Taught by Kathleen Gilhooly. Cost is $150. For students who have had two years of prior study, and are not yet ready to enroll in the Intermediate class. For students who have had three years of prior study, and are not yet ready to enroll in the Intermediate class. • Saturdays 10:00 am – 12:00 pm: January 26 – May 4, 2019. For advanced students who have had three or more years of prior study, to increase their reading, writing and conversation skills. • Wednesdays 6:55 – 9:25 pm: January 23 – May 1, 2019. Taught by Jill McMahon. Cost is $175. We want to continue to offer high quality Irish Language events and need your help to do so. There are many opportunities to get involved. The ICC Board has a language subcommittee. Its role is to raise funds, develop the annual language day, help select Irish language films for the Film Series, and identify other avenues to reach the community. Please contact Gerald Costello if you would like to be involved.